A dangerous demon she can't resist...Malkom Slaine: tormented by his sordid past and racked by vampiric hungers, he's pushed to the brink by the green-eyed beauty under his guard. A maddening witch he aches to claim...Carrow Graie: hiding her own sorrows, she lives only for the next party or prank. Until she meets a tortured warrior worth saving. Trapped together in a savage prison...For them to survive, Malkom must unleash both the demon and vampire inside him. When he becomes the nightmare his own people feared, will he lose the woman he craves body and soul? This will only be available as an e-book at this time; the trade paperback from Dorchester Publishing will not be available until May 2011. Fallen angels… They rule Moscow’s seedy underworld, promising untold pleasure to the females who dare to mate them. That promise – and Brends Duranov’s own raw sexual power – has hopefuls mobbing the velvet rope outside his elite club G2’s. But Mischka Baran has no intention of hooking up with one of the Fallen. Not even after Brends gives her an unforgettable taste of the sin and seduction he can deliver with those wicked lips. She’s after information, not a stint as some Goblin’s toy of the month. 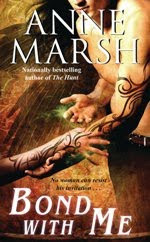 What she doesn’t know is that with a sadistic killer carving up his brethren, Brends is playing for keeps, hunting the one woman whose bloodline can end the mayhem, whose bond can restore his lost wings. HOORAY! I am hoping Demon From the Dark gets me out of my current reading funk. I was able to read an ARC of Sin Undone and it is so awesome!! I love Sin!!! I just got my copy of Demon from the Dark. I can't wait to get off work so I can go read it! Sin Undone sounds hot. I want to re-read the earlier books first before I start on Sin.